I love my hometown, and it will always be the best place to come home to. The outdoor beauty of Northern Idaho is unrivaled. 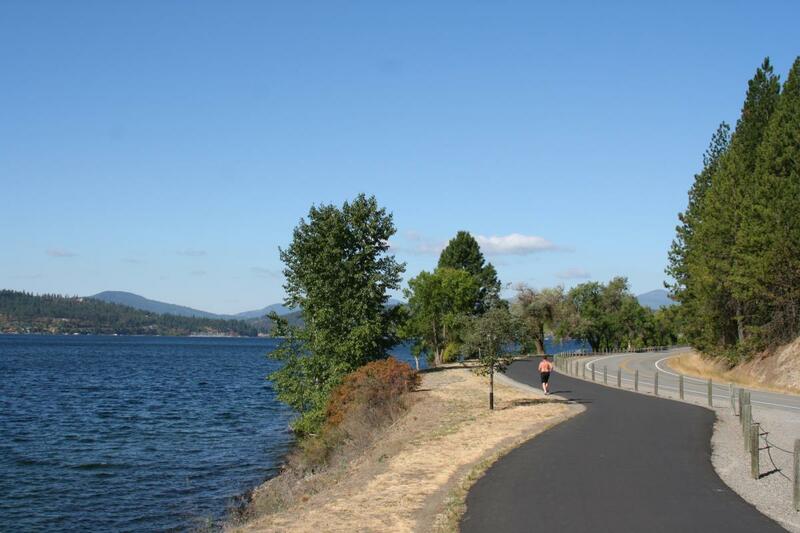 Whether you feel like biking through the mountains on an old train track on the Hiawatha Trail, water skiing across the many beautiful bays of Lake CDA, or simply strolling along the lakeside, riverside, or forest paths in and around town, you’re spoilt for choice. It’s hard not to become a fitness enthusiast here, and it definitely doesn’t require a gym membership. My preferred activities are simple – trail running, lakeside yoga, and maybe a kayak or SUP session if the weather is balmy. One other bit I love about Coeur d’Alene that you won’t find in the more populated areas of the Northwest: when you’re out hiking or exploring, you’ll see some people (which makes me feel safe and reminds me of that nice sense of community and outdoor camaraderie) but not too many (so you can still enjoy your peace and quiet). I love that there isn’t overcrowding going on yet. 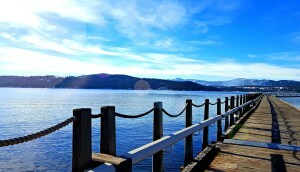 Yes, I’ve gushed about the beautiful seasons here in Coeur d’Alene. Spring, summer, winter, fall…there’s something so special about each and every one of them. I’d have to say personally, summer and fall have tied for my favorites. Summer gifts us with long days, an abundance of local (wild) fruits and veggies ripe for the picking, and the heat needed for a lot of water-based activities. Fall, however, brings with it the most delightful array of colors, a crisp bite in the air that I adore, and the intrigue of snow-to-come. It also quiets down in town, as the summertime crowds have dispersed to their respective homelands. 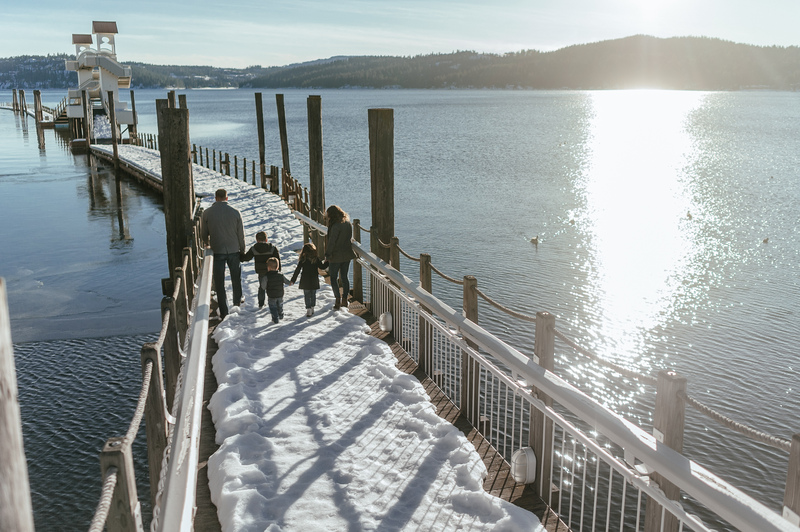 You’ll find so many reasons to visit Coeur d’Alene, any time of the year. You really can’t go wrong! If you like snow sports, definitely visit us in winter, as there are an abundance of local ski resorts to enjoy. I’ve been a foodie ever since I went to college, but what that means to me has changed quite a bit every time I come home. A dedicated locavore, I love that Coeur d’Alene brings locally-roasted coffee, locally-made beer and wine, and other locally-sourced favorites (like fresh baked bread and CSA boxes) to the table. It’s really easy to enjoy a good cup of java here (check out Evans Brothers or Coeur d’Alene Coffee Company downtown, or if you find yourself on the north side of town, Anchored Coffee is a good bet). It’s also just as easy to get an epic meal here, whatever your dietary preferences. It’s been a bit more challenging being a vegan in Coeur d’Alene, but watch for a blog post to come – I’m going to shed some light on the vegan scene in this lakeside town. Luckily I’ve found ways to tweak my favorite dishes at my go-to spots. You have to check out Fire Pizza downtown and order the Gordy Pizza. Just trust me. Don’t eat too much because the next morning you better get yourself over to Garnet Cafe for the most delicious locally-sourced breakfast you’ll find in town. Ask for a side of nutritional yeast and you’re taste buds will be singing. If you’re not vegan, try their amazing homemade lemon curd. 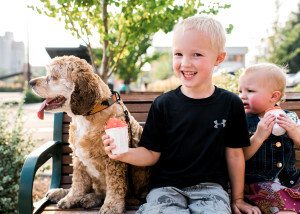 The locavore within also loves the summer Farmer’s Market that runs from May until September. You’ll find the Saturday market in Hayden and the Wednesday evening market downtown, and both offer an impressive amount of local vendors selling their goods. Try the kombucha and the aebelskivers! Now, humans certainly were not the first to discover the beauty of this area. The wildlife in Coeur d’Alene is breathtaking. My parents have turned into birdwatchers since moving here, and I’m ready to join them. We constantly ogle over bald eagles, osprey, great blue herons, loons, hummingbirds, geese, swans, hawks, sandpipers, mallards, robins, swallows, and a variety of other birds on the regular. It’s become a fun game to try and identify all of the different lake birds that pay us a visit. And aside from our winged friends, we have moose, elk, and deer that often wander dramatically across our lawn. If you haven’t seen a moose, MY GOSH, they’re huge and you should keep your distance – but they are breathtaking. We do have black bears and a few mountain lion sightings every year, so it isn’t recommended to go hiking alone. But generally, these large mountain critters keep to themselves. It’s fun to explore the natural areas around Coeur d’Alene with a camera if you’re a wildlife enthusiast. If you think Pacific Northwest, you’re talking about elk and bears and moose – and we’ve got it! Right now (November and through winter) is the perfect time to spot bald eagles. I’m headed out this afternoon with a camera to try my luck. 5) THE REST OF THE NORTHWEST IS NOT FAR! 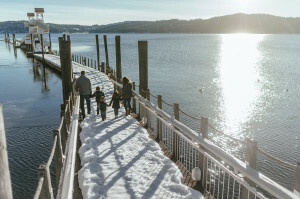 I love that Coeur d’Alene is a bit tucked away from the hustle and bustle of Spokane and the farther hubs of Seattle, Tacoma, Portland, etc…but if you want to go and explore any of those places, it’s only a half day drive away (or a 45 minute plane ride). It’s very convenient having the Spokane Airport so close, and there’s also a train station in town or, of course, the good ole Greyhound. Your opportunities for adventure are endless if you decide you want to leave Coeur d’Alene (but why would you?). 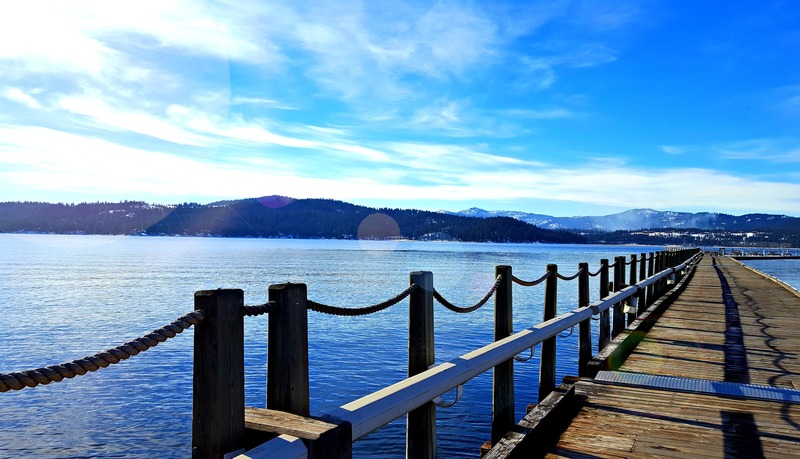 My favorite weekend getaways are Sandpoint, Idaho and Whitefish, Montana, both cute towns with a lot of character and epic mountain/lake scenery. I recommend you go check those places out as well. I sure hope I’ve convinced you to at least acknowledge Coeur d’Alene the next time you hear someone mention this weird-sounding place. I’m proud of my hometown and I hope you enjoyed reading about it! Curious where the name comes from? 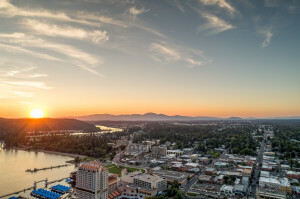 The city is named after a tribe of Native Americans, called the Schitsu’umsh or “those who were found here,” who lived along the rivers and lakes of the region. The local people were encountered by French fur trappers in the late 18th and early 19th century, who gave them their French name. Coeur d’Alene means “heart of the awl,” possibly referring to the tough business practices of the Schitsu’umsh tribe (they were considered sharp-hearted and shrewd). 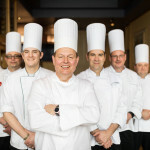 About: Our fabulous Resort Employees are dedicated team players who bring energy, ideas and pride to their work and our company culture as a whole. We are so excited to share their behind-the-scenes details, stories, and fun-filled expeditions as employees of The Coeur d'Alene Resort!